Take a pressure cooker and put mutton (250g), red chilli powder (2 tbsp), ginger- garlic Paste (1sp), turmeric powder (1/4sp), cinnamon (1/2sp), cardamom (1), clove (1/4sp), salt (to taste) and water (2glasses). Allow to get 2 vesicles. Heat oil in a kadai and add curry leaves, slit green chillies and then add chopped onions. Fry till lightly brown and then add ginger garlic paste and fry. 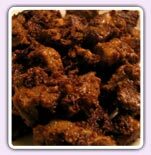 Add cooked meat, garam masala powder to it and mix well and stir and fry well till the water evaporates and mutton turns brown.